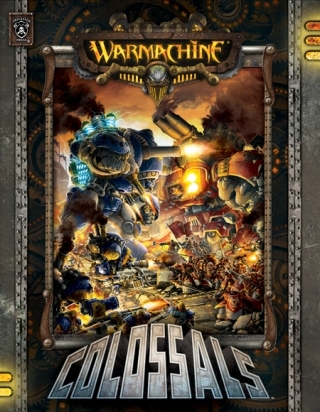 3 for Intelligence: Privateer press July releases: Collosal! Just in time (Hopefully) for me to get the brunt of my Legion force, Privateer press is coming out with another book and man is this one big. "Darkness descends upon the nations of the Iron Kingdoms as the undead legions of Cryx overwhelm Point Bourne, revealing their true strength. As war once again consumes the land, the embattled nations race to deploy colossal warjacks bristling with weaponry to turn the tide. But the emergence of new threats, both ancient and unseen, will force old enemies into uneasy cooperation in a fight for survival! Powerful new colossals—enormous warjacks that dwarf even the largest heavy ’jacks and bring all-new strategies to the table. New warcasters for each faction, including the third incarnations of some of the Iron Kingdoms’ greatest champions. Fully compiled and updated Unbound rules, allowing you to recreate iconic large-scale battles with specialized rules to enhance gameplay. New narrative fiction picking up directly after the exciting events of WARMACHINE: Wrath. A painting and modeling guide to help you prepare your colossals for combat. Theme Force lists for each new warcaster, which allow you to create armies based on the specialized forces found in the WARMACHINE world. FOCUS YOUR WILL AND CRUSH THE ENEMY BENEATH YOUR COLOSSAL MIGHT!" The Conquest is a walking mountain of steel bristling with some of the most powerful weapons ever used on the battlefields of the Iron Kingdoms. The deafening roar of the colossal’s steam-fed engine is punctuated by the staggering percussion of its devastating guns, which unleash a punishing barrage of shells able to reduce warjacks to slag and annihilate entire enemy formations. Deployed to the front lines, the Conquest brings unrivaled firepower to Khadoran battlegroups. The Conquest colossal comes in a box (PIP 33050) and includes a colossal wreck marker. A player may field up to two Conquests for each warcaster in a Khador army. designed to tear through the thickest armor and bring enemy warjacks to their knees. Iron Fang Pikemen units for each warcaster in a Khador army. will no longer be available from Privateer Press beginning July 1, 2012.
his veins lends him the strength to secure victory. souls, fueling its power even as it protects the righteous. 32025 and 32038 will no longer be available from Privateer Press beginning July 1, 2012.
resound off trees and mountains. Wrathar leads the chorus of his brothers Tor and Rhudd. supernatural cold they can manifest to cripple the enemies of the Circle Orboros. number of Winter Argus in a Circle Orboros army. action these creatures carry out the will of their masters and the dragon itself. each warlock in a Legion of Everblight army. of enemies even as he shatters entire formations with his powerful tetsubo. to this kit. A player may field one Tiberion in a Skorne army. Seems like some interesting stuff. I'm sure the colossals will shake up the higher point games. Too bad they are not coming out with all of them at the same time though. What do you guys think about them? The price tag is a bit high for me at the moment. Are they going to be tournament staples or just fancy big models?? ?